Winners of the June 27 1/2-A Combat contest (from left) Bob Smith, Mel Lyne, Tristan McKay, Jeff Rein, Don McKay. All photos contributed by Mel Lyne. Saturday, June 27, Duvall, Wash.
What is this about? Isn't it Number 9, Number 9, Number 9, not when you fly combat? More about this later. 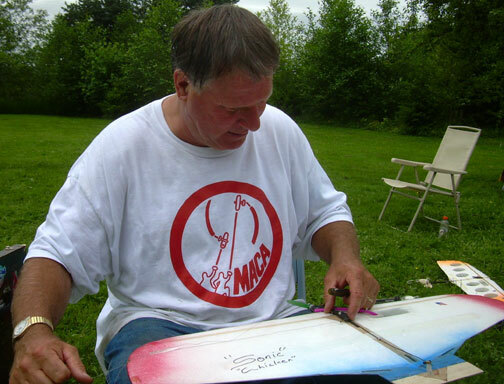 Don McKay worked with the city of Duvall, Wash., to get permission to use McCormick Park for a Half A contest. It is a great site with the only drawback being a long walk to get to the site. There is enough room to run Half A as well as D-Bat. Don offered equipment for Mel Lyne (the Alien) to use as well as a room at his house if he would come down. Jeff offered equipment to Kenny Johansen if he would fly and he took him up on his offer. Don's son, Tristan as well as Robert Smith and me turned out to fly. Ken Burdick claimed to be in Canada. Seven flyers meant that two would fly, two would pit, two would judge, and one could work on equipment or find a tree. Tristan McKay (left) and Don McKay did most of the judging. Prior to the contest, Don set the matches and assigned a number to them. Everyone would fly each other one time, the order of flight did not matter. If your equipment was ready, then you could fly who ever was ready that you had not flown. This meant seven contestants would fly six matches. There would be no final, best record would be first, second best second, etc. This should have made for a smooth flowing contest. In theory, yes, but this is Half A. After the first matches, things slowed down as equipment needed repairing and changing. Now for some highlights. How many times can you midair a plane? In my match with Robert, there were four mid air hits -- a new record for "Thanks a lot Bob." Number Four, Number Four, Number Four. Buzz and Bob after their "midair match"
The best match of the day was between Jeff and Tristan. Tristan flies when time permits, this contest was his fourth contest and somewhere around his fortieth C/L flight. He and Jeff went at it hard for the entire match. Jeff got one cut on Tristan. Tristan got four cuts on Jeff the last being about one inch long. Number Four, Number Four, Number Four. With nothing left but the knot on Jeff, Tristan took the knot for the kill. The following is Jeff's version. "When I flew Tristan we were mixing it up and flying clean. Boom, he got a cut and I said 'Good shot'. We continued to mix it up and about 20 seconds later bam, he got another cut. I said damn, time to stop fooling around and I put it into high gear. I then got a cut back and decided it was time to end this thing. Wrong! He ended it by getting 2 more cuts and a kill. To coin a phrase by Rich Tupper from the World Championship, 'Cut up like a Safeway Chicken.' No line tangles, collisions or crashes." Tristan celebrates win over Jeff. One of the most interesting matches was between Tristan and Robert. 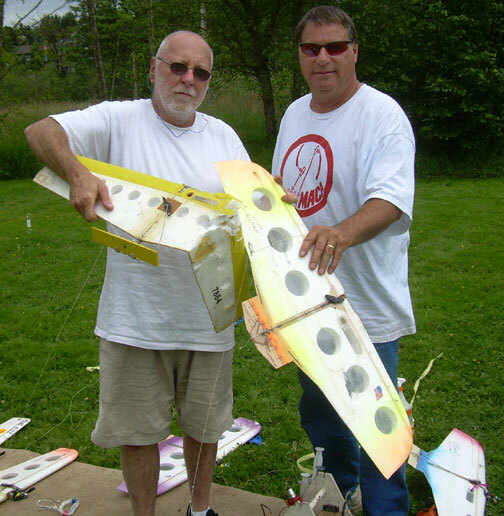 During the match, Robert managed to get his plane wrapped around Tristan's lines and the engine shut down. 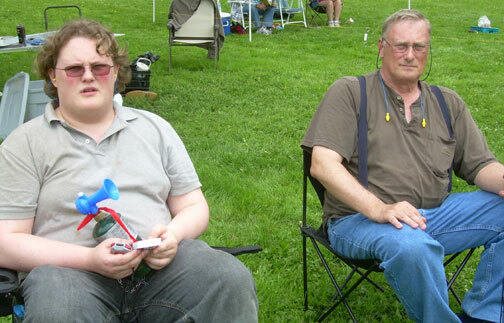 This left Tristan flying his plane and towing Robert's. This went on until the plane worked down the lines with Don shouting for Robert to grab the plane. Robert did, Tristan crashed and lost the match. Thanks a lot Don. The following photo shows the line ball and Robert's new handle carved from old growth timber. Don provided one of the more humorous starts for the day. As he dropped his electric starter, and started running to the circle, he got the cord wrapped around his ankle. Rather than bend over and unwrap the cord, he began shaking his leg to free himself from the biting starter. 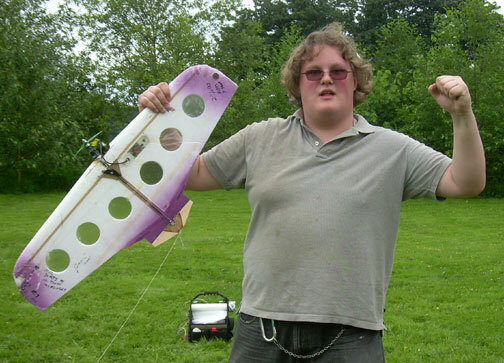 Kenny had to dork his plane when it was pointed out that he did not tie a streamer on. Well Don had said reuse your streamer. Kenny must have figured since he had been killed he would reuse it. Kenny had his own cheering section his wife, Penny, and daughter Nicky. After twenty-one matches, it was time to figure out the winners. Looking at the board there were four flyers with four wins, Jeff, Don, Robert and Mel. Number Four, Number Four, Number Four. Looking at their records against each other none had beaten Jeff. Jeff would be number one. After looking at the remaining flyers records against each other, it was still a tie. Looking further into the matches, it was still a tie between Don, Robert, and Mel for second place. Tristan finished fifth and awarded the "Top Amateur." 5. Tristan McKay, Redmond, Wash.
6. Buzz Wilson, Belfair, Wash.
Kenny Johansen, Fall City, Wash.
Bob Smith works on a Sonic Chicken, designed and built by Jeff Dawson. Buzz Wilson (left) and Jeff Rein prepare for a start. 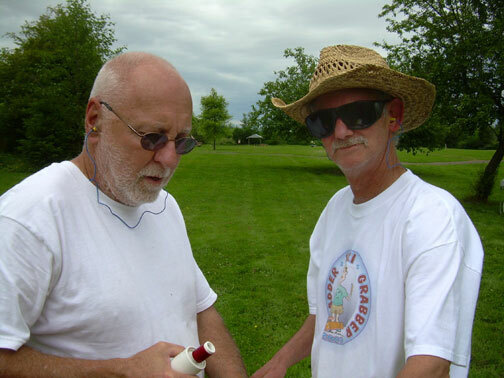 Tristan McKay (left) and Don McKay examine a Sonic Chicken.